One bedroom second floor Artsy condo in a 79 unit complex with bedroom and deck overlooking Maalaea Bay (whale watching) and Haleakala (10,000+ foot dormant volcano). Wireless internet and cable TV equipped. Ceiling fans in each room--NO AIR CONDITIONER. Tastefully decorated with original art. Swimming pool and large BBQs. Laundry facilities on site. Immaculate golf green appearing lawn good for bocce ball. 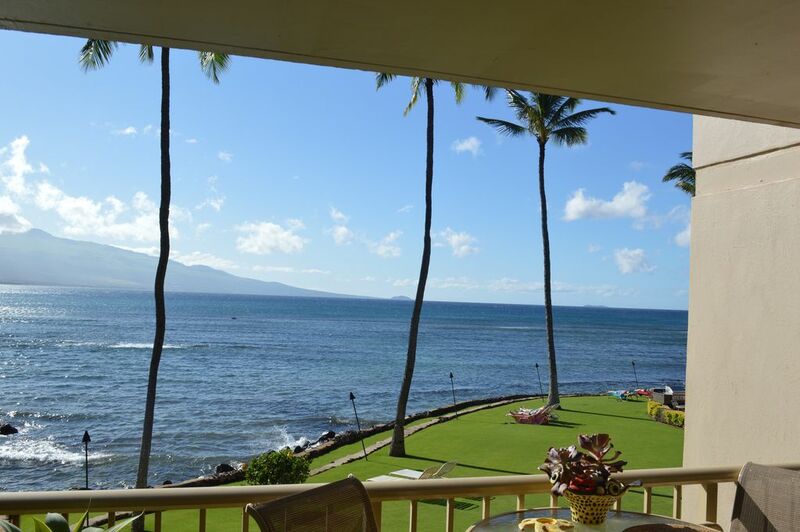 Strategically located almost equal distant from popular tourist locations of Kihei-Wailea, Lahaina and Wailuku-Kahului (airport). Adjacent on street parking. The owners are a retired Oregon Assistant Attorney General and a retired Oregon public school teacher (home economics and art) living in Portland, Oregon. They are native Oregonians having attended the University of Oregon (and Harvard Law School) and Oregon State University respectively. They are golfers, gardeners, readers, travelers and amateur artists. They have a blended family of 5 children and 7 grandchildren in Portland, Berkeley and Sequim, WA which they try to keep up with. We bought this property because it is our favorite place in the world. As Mauians say "Maui no ka oi," which translates as "Maui is the best." We love the climate, the culture and the people. It's Hawaii! Need we say more? Owners also own a vacation rental in Portland, Oregon which they list with VRBO (#485443). Thanks for your kind review of your Dec 25-30 visit. We hope that you will be able to return. Absolutely gorgeous! We had a fantastic time on Maui and our condo could not have been better. Had such a fantastic time on Maui. The condo could not have been nicer. Such a wonderful location on the island and easy to get anywhere we wanted to go. Highly recommend this location. We couldn’t have asked for a better place to stay. The condo had everything we needed and made us feel like we belonged. The breezes were so welcoming and watching the turtles everyday was awesome. We really appreciated how nice and clean the condo was and we never had any problems with anything. Happy hour was a 5 minute walk. This condo is located in the middle of everything. We could go to Lahaina and Kihei both were opposite directions. Beaches were within walking distance. The condo had a cooler and beach chairs. This was very useful and appreciated. I would highly recommend this condo. Can’t say enough great things about it. Thank you for your kind review. We look forward to hosting you again. This place was amazing! Full of everything needed. Just had to buy groceries! It’s right on the water and the view is beautiful. It’s full of really interesting art and it made me smile each time I opened the door. The only thing that could possibly oh make this place better is a/c but even without it, this place is a complete gem! Pool was so nice and there is a community bbq area. Not a ton of people using all the amenities which made it a lot nicer than staying at a hotel. There was even coolers, boogie boards, and beach chairs for us to borrow. I really appreciate the owners having us! It was the time of my and my husbands life to be in Maui and I really can’t wait to go back! This place exceeded my expectations!! I fell asleep listening to the ocean. The ocean is literally 5 feet away. It's about 20 minutes from the airport and it was centrally located for every thing that I wanted to do in Maui!! When I come back to Maui, I would definitely stay here again!! I really didn't want to leave. It was a great place. We loved seeing the seaturtles right from the balcony and swimming with them right in front. The decor was beautiful and a great touch! Very memorable . Thank you for opening your home. On site swimming pool. Within walking distance--long swimming and walking sand beach, shops, restaurants, mini market, aquarium and fishing and tour boat harbor.